Indesit tumble dryers are designed to make laundry days easier. If you choose an Indesit tumble dryer, you can forget about hanging clothes out on the washing line and waiting all day for them to dry. The Indesit range of tumble dryers includes vented dryers as well as condenser versions that you can place anywhere in your home, as they don’t need to be vented. Indesit tumble dryers look good and come in variety of finishes including classic white, silver or black so you won’t have to worry about them fitting into your carefully chosen kitchen design. Indesit tumble dryers are compact and energy conscious, so your loads will have less of an impact on the environment. Each Indesit tumble dryer has an impressive range of heat settings that offer you the optimum temperature for every load. And because Indesit tumble dryers are fully programmable, there are plenty of functions to choose from to ensure you get the best out of them no matter what you need to dry. 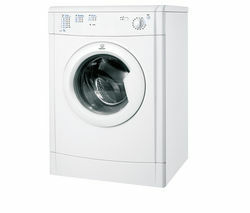 If you can’t find an Indesit tumble dryer you like, check out our range of Hotpoint Tumble Dryers. And if you don’t find anything suitable there, take a look at our selection of Bosch Tumble Dryers. 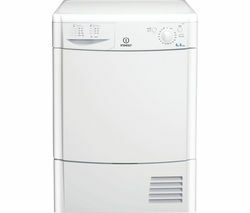 Whether you’re looking to save time or energy on laundry day, an Indesit tumble dryer is ideal.